AAPM jest największym stowarzyszeniem fizyków medycznych na świecie. Podczas tegorocznego spotkania, w 30 prezentowanych pracach podkreślano znaczące korzyści wynikające z możliwości wykonywania zabiegów radioterapii adaptacyjnej z użyciem MRIdian®. 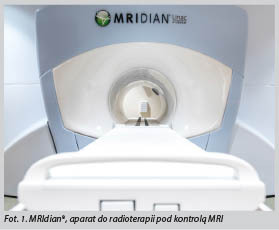 Radioterapia adaptacyjna pod kontrolą MRI – możliwa obecnie tylko na urządzeniu MRIdian® – pozwala na zmianę schematu frakcjonowania dawki i bardzo precyzyjne dopasowanie tego schematu do aktualnej anatomii pacjenta. W trakcie Sesji Naukowej AAPM dodatkowo wskazano, że MRIdian® wraz z w pełni zintegrowanym systemem planowania Monte Carlo pozwala na sprawne przeprowadzanie terapii adaptacyjnej. Powtórne planowanie zajmuje nie więcej jak 2 minuty. Carri Glide-Hurst, Ph.D., from Henry Ford presented on their initial patient experience with MRIdian Linac including treatment times of 6.25 minutes for 8Gy stereotactic body radiation therapy (SBRT) treatments and 5 minutes for prostate intensity modulated radiation therapy (IMRT) treatments. She also showed MRIdian movies on how the system’s real-time imaging during treatment automatically detected and paused the treatment when a transient gas bubble shifted the prostate. Additional patients in the queue for Henry Ford include liver SBRT, retroperitoneal SBRT and accelerated partial breast irradiation (APBI). Anthony Doemer, M.S., from Henry Ford highlighted the ultra-sharp beam characteristics for the RayZR Double focused MLC. Because of its innovative design, it removes the need for tongue and grooves, nearly eliminating any leakage through the leaves (average leakage, less than 0.001 percent). “We were able to successfully commission the MLC with great agreement between measured small beam profiles of 0.2 x 0.4 cm and larger profiles matching very well with the Monte Carlo simulations with tight conformance to the beam model,” said Mr. Doemer. Yingli Yang, Ph.D., from UCLA presented on MRIdian’s high quality MRI images, specifically the superior soft-tissue image quality enabled by MRIdian’s innovative processing techniques. Dr. Yang also highlighted early research imaging results acquired using a new MR acquisition technique reducing the imaging times of 17 seconds down to approximately 12 seconds. This 3D MRI sequence provides motion artifact-free images with a large field of view (FOV) for short breath hold. She also presented research on a 3D MRI acquisition scheme that is insensitive to motion and will enable free breathing MRI for patients who are unable to hold their breath. Vivian Rodriguez, Ph.D., from Washington University shared their extensive experience with on-table adaptive therapy, illustrating the significant anatomical changes that can take place within a short period of time and highlighting case examples where the treatment plan was reoptimized to escalate or de-escalate dose based upon the proximity of nearby critical structures while the patient was on the treatment table. “With a single button click we can replan within a minute a new treatment plan that reduces dose to organs at risk while giving a greater dose to the target,” said Dr. Rodriguez. Kathryn Mittauer, Ph.D., from University of Wisconsin shared their experience personalizing patient treatments through daily dose-guided radiotherapy using online recalculation and evaluation of the actual dose distribution. “We’re able to deliver higher doses to targets adjacent to organs at risk due to improved confidence in treatment set up and delivery that would not otherwise be clinically feasible,” said Dr. Mittauer. 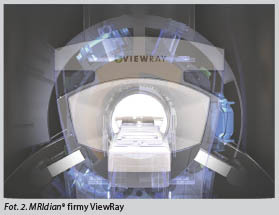 To watch video recaps from some of the in-booth MRIdian user presentations at AAPM, please visit http://www.viewray.com/aapm_2017. Więcej informacji na temat MRIdian znajdziecie Państwo na stronie firmy CONSULTRONIX S.A.
Trichoskopia bez tajemnic jak kompleksowo zatroszczyć się o pacjenta?